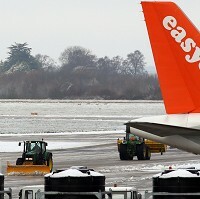 Airports across Europe could be affected by recent heavy snowfall with Lyon airport remaining closed, according to easyJet. The no-frills airline warned passengers to prepare for "a possible risk of large accumulations of snow" at major European airports. Spokesmen from easyJet said that Geneva, Zurich, Cologne, Paris, Amsterdam, Dusseldorf, Basle, and Brussels airports are at risk from the adverse weather conditions. It also advised travellers heading to Lyon to prepare for potential delays as the airport remains closed as a result of snow. People flying into the French city are being urged to plan ahead before travelling. Despite snow currently being removed from the French airport, Eurocontrol warned that it might take time before normal flight schedules will be resumed. The airline also called for passengers flying to Europe to allow extra time for their trip to the airport and urged them to check the status of their flight before heading off. Most flights across Britain were unaffected by the weather conditions on Monday, but Leeds Bradford airport suffered some delays. People planning to jet off this week should not only check the status of their flight before heading to the airport but also their travel insurance policy to prepare for possible cancellations.